Toe to Heart in fact starts as a love story. In 2003 Thomas van Berckel decides, after working in Gouda and Afrika to continue his volunteer work in Bangalore, India to commit his forces to less fortunate fellow human beings over there. When Thomas injures a toe on Mahatma Gandhi Road a nurse called Lalitha takes care of him. She doesn’t only take care of the toe but also touches his heart. The two decide to get married and Thomas takes up residence in Bangalore. A daughter, Eva is born. 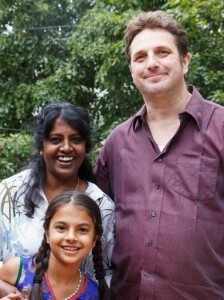 Through Lalitha’s sister, a teacher by profession, Thomas gets in contact with the St Paul’s School. Most students are from lower middle-class families, but there are also children of poorer families who dream of a better future. Unfortunately, education at the free Indian government schools is too often below par. The parent(s) of a number of children cannot, for different reasons, pay the school fees of their children anymore. In those cases children are allowed in school, but don’t get any uniforms and cannot participate in examinations. As a consequence these children cannot pass and go to the next class, cannot graduate. Their future is uncertain. Seeing all of this Thomas and Lalitha felt that they should in some way help these children in need. They started organizing “after school activities” and from 2004 on Toe to Heart took in a fixed group of 15 children from an underprivileged neighborhood in Bangalore. Thomas and Lalitha guarantee these motivated and talented children that school fees and additional school costs like books and uniforms will be taken care of. In addition to this Thomas and Lalitha give these children the opportunity to become each other’s “extended family”, a place where they can laugh and play, do their home work and above all learn and feel the sense of belonging. They inspire and help each other. After 10 years the success of this concept is evident. Initially the goal was to help as many children as possible to finish high school. Meanwhile there are more ambitious plans: some of the older, very talented children with the help of Toe to Heart have started or already have completed PU1 and PU2. Thus they serve as an example for the younger ones and inspire them to strive for more.